Hookup culture has become widespread on college campuses, and Catholic colleges are no exception. Indeed, despite the fact that most students on Catholic campuses report being unhappy with casual sexual encounters, most studies have found no difference between Catholic colleges and their secular counterparts when it comes to hooking up. Drawing on a survey of over 1000 students from 26 institutions, as well as in-depth interviews, Jason King argues that religious culture on Catholic campuses can, in fact, have an impact on the school's hookup culture, but when it comes to how that relationship works: it's complicated.In Faith with Benefits, King shows the complex way these dynamics play out at Catholic colleges and universities. 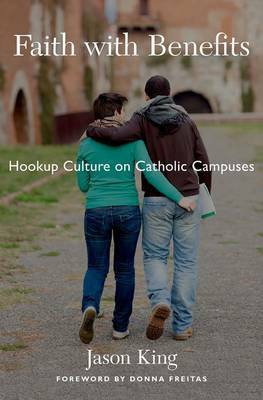 There is no straightforward relationship between orthodoxy and hookup culture--some of the schools with the weakest Catholic identities also have weaker hookup cultures. And not all students define the culture in the same way. Some see a hookup as just a casual encounter, where others see it as a gateway to a relationship.Faith with Benefits gives voice to students, revealing how their faith, the faith of their friends, and the institutional structures of their campus give rise to different hookup cultures. In doing so, King addresses the questions of students who don't know where to turn for practical guidance on how to navigate ever-shifting campus cultures, reconciling their faith with their relationships. Students, parents, faculty, administrators-indeed, anyone who cares about Catholic teenagers and young adults-will find much of value in this book.